John Wayne and Gabby Hayes strike it rich with a gold mine. Inevitably some villains want to take it from them. 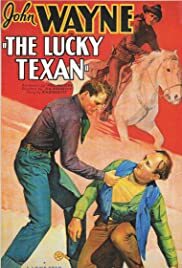 This is one of the most interesting of the many B westerns Duke made in the '30s. For one thing, there are surprisingly few gunshots fired in this one. Everyone seems to settle their problems by fisticuffs or by chasing one another. There's a lot of chasing in this one. This leads to some good Yakima Canutt stunts, though. Also, I'm not sure what era this was supposed to take place in. Lone Star wasn't known for caring about historical accuracy in these cheap B westerns. There were usually shots of telephone poles and the like in the background. In this one we not only have the usual background stuff but we have a Keystone Kops-style climax that features Gabby Hayes driving a car after the bad guys! This western, like the other B's made in the '30s, will seem pretty much like kids stuff today. But there is some fun to be had with it.